I love peanut butter. It's a lot more common in baking than in savory dishes, but the opportunity to use it in a main course should not be missed. 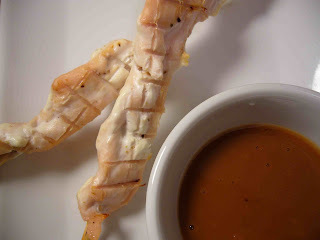 You may be accustomed to peanut dipping sauces at restaurants, but this is a really easy one to make at home. I have to admit, the chicken skewers were an afterthought because I needed something to dip in the sauce, but with a protective coating of our friend Fage, these skewers came out really delicious on their own. Slice the chicken breasts into half inch strips and thread onto skewers (if using wooden skewers make sure you've soaked them in water for at least an hour to keep them from catching fire on the grill). Mix salt, pepper and cumin together and sprinkle seasoning over both sides of the chicken skewers. Brush Fage over the skewers so chicken is covered in yogurt and chill for at least an hour. Oil and heat grill to medium high. Cook skewers for four minutes, flip over and cook for an additional two minutes or until fully cooked. Add first five ingredients and 1/4 cup of water to a small pan and heat over low heat. Stir constantly with a whisk and as sauce begins to reduce add remaining water 1 T at a time. This can be made ahead of time and left resting until chicken skewers are finished. If the sauce has thickened too much while resting, add 1/4 cup of water and heat slightly over low heat. Serve alongside skewers and enjoy!